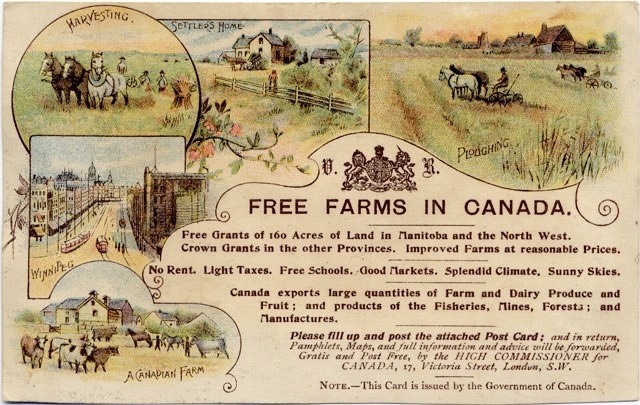 Free Grants of 160 Acres of Land in Manitoba and the North West. Crown Grants in other Provinces. Improved Farms at reasonable Prices. No Rent. Light Taxes. Free Schools. Good Markets. Splendid Climate. Sunny Skies. Gratis and Post Free, by the HIGH COMMISSIONER for CANADA, 17, Victoria Street, London, S.W. NOTE.—This Card is issued by the Government of Canada. 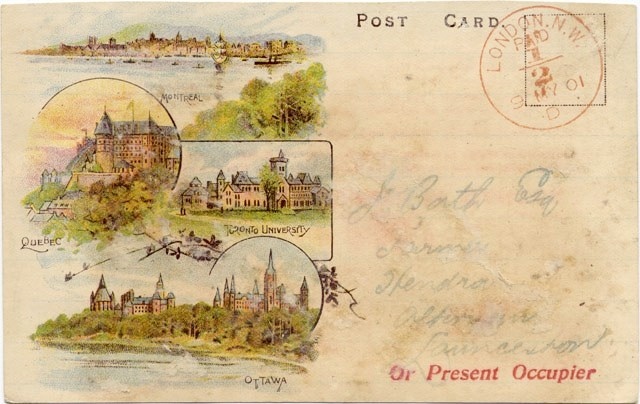 Below, the address side of the card shows a series of vignettes of Montreal, Quebec, Toronto and Ottawa, some of which match images from the Toronto Litho Company’s Cities of Canada series of pioneer postcards first issued in 1898. Since the design and style of the card are similar to that of the Toronto Litho cards, it appears this card may have been printed by the Toronto Litho Company for the Crown. It has been speculated that the other cards in the series attributed to the King’s Printer may also have been printed by the Toronto Litho Company. The card has been mailed at a bulk rate on May 9, 1901 within London, England to J. Bath Esq. at an English address. One edge of the card has been trimmed, likely where the attached return card was removed to be forwarded to receive the pamphlets and maps promised by the government.